Dragonfish, also called dragon goby and violet goby, can grow up to 2 feet long. They have characteristic eel-like bodies, large heads in proportion to their bodies and dorsal fins running practically the entire length of their bodies. Their big teeth give them a menacing look, but they are not nearly as aggressive as they appear. In fact, they are shy fish that love to hide and generally come out during the night to feed. They may eat small, injured fish or sick ones at times in the fish tank, but they are not predators. The dragonfish is primarily a scavenger. It scoops gravel from the substrate, filters out the edible material from it and then spits out the gravel before swallowing the food particles. It also uses its large teeth to scrape algae from rocks. It is not an aggressive eater and may end up getting bullied by other fish when you introduce food into the tank. In the wild, dragonfish live on algae, plankton, marine invertebrates, insects and insect larvae living in the sand. The fish is omnivorous and thrives on a high-protein diet in captivity. Feed your pet dragon fish algae wafers, live brine shrimp, mysis shrimp and daphnia. Dragon fish will also consume frozen bloodworms, krill and glassworms. 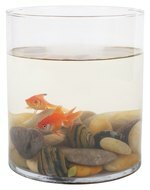 In addition, you can feed your pet fish pellets and vegetable flakes. Also occasionally feed the fish snails to prevent its teeth from growing too long. If the teeth keep growing, the dragon fish will be unable to eat and could die. Feed your fish once a day. Provide it with however much food it can eat within two minutes. If you overfeed the fish, the uneaten food remains in the fish tank and begins to decay. This leads to poor water quality, as it provides a breeding ground for bacteria. This will make your dragon fish more susceptible to diseases, such as fin rot and columnaris. To avoid poor water quality, do partial water changes once a week. Siphon off 10 percent to 15 percent of the water and add fresh water to the tank. Clean the filter each time you do partial water changes. Make sure that the tank has ample plants and caves for the fish to hide. Use plastic plants, as the brackish water in the fish tank will not sustain most living plants. Keep the water temperature around 80 degrees Fahrenheit. Do not allow the water temperature to fluctuate, as it could cause appetite loss and a weakened immune system. Maintain the pH between 6.5 and 8.5. If you are keeping multiple dragon fish, allow 25 gallons of space for each fish. 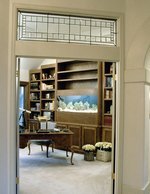 For one fish, keep a 50-gallon tank which is a minimum of 4 feet in length. In big tanks, install multiple filters to clean the water, as one filter may not suffice. What Are the Names of Fish That Are Scavengers?